Marion Cotillard plays an unapologetic afflicted misfit in 1950’s France, seeking a cure in the swiss alps. A tragic romance ensues with a shut-in lieutenant (Louis Garrel). From the bizarre trip inside the delusional mind of a lunatic, it becomes evident: her suffering can’t be helped. Rose was there. Somewhere between Bill Cunningham and Weegee she planted herself, sure and stout. Not afraid to speak her mind, Rose is unfazed by anyone’s power, she rather takes it in. Just when things appear dull, Rose draws you near her and she tells you something sensational in a hushed whisper. Rose captures the moment without disrupting it, because she is an integral part of it. The vibrance, joy, opulence, and electricity in the images are the current that runs through her and her lens. Andy Warhol and Lou Reed photographed by Rose Hartman. Rose was everywhere I wished I could’ve been. All the places I just heard or read about or saw in magazines. Rose lives the dream and in photos it seems sweet and beautiful. What’s most impressive is she has so much to show for being there, the stunning work she did. The fact that she and her work endures gives restorative energy to those who hoped but were beaten down by adversity, shunned by the precarious uncertainty of an artist’s life, and plagued with self-doubt. Here is a woman who can show you how to grab life by the lens. Experience a closer look at Rose and her work in the documentary The Incomparable Rose Hartman which premieres tomorrow at DOC NYC. In the statement issued by Conde Nast, the Metropolitan Museum Costume Institute Manus x Machina “exhibition showcases the traditionally opposing roles of hand and machine in the creation of haute couture and avant-garde ready-to-wear and explores the unification of the two through the evolution of technology.” When entering within the cathedral setting, and considering the heavy-handed selection of couture wedding gowns in this exhibition, you almost feel as if there is a rushed marriage occurring between Apple and Conde Nast. Exhibition entryway, House of Chanel (French, founded 1913) Karl Lagerfeld (French, born Hamburg, 1938) Wedding Ensemble Autumn/winter 2014-15, haute couture Courtesy of CHANEL Patrimoine Collection. The stunner, pictured above, when observed in profile: an extra-long train balances the proportions of what can only be described as Rotund silhouette. Hushed whispers at the first viewing of this exhibition were wondering, was the bride expecting? What I have to wonder is, how is there an entire wing of the museum dedicated to fashion and its history, yet in the United States we still cannot acknowledge that the works of these designers should be protected as their own highly valuable intellectual property? Mary McFadden (American, born 1938) Dresses 1908-1987 “Marii” machine-pleated, hand-stitched with hand-embroidered panels of polychrome sequins. House of CHANEL (French, founded 1913) Karl Lagerfeld (French, born Hamburg, 1938) Wedding Ensemble. Autumn/winter 2005-6, haute couture Courtesy of CHANEL Patrimonies Collection. Powerful as the the clothing exhibited may be, who has the ultimate upper hand in the overarching relationship? Why does a would-be blushing bride have tears in her eyes? Apple’s sponsorship statement says “Ultimately, it is the amount of care invested in the craftsmanship, whether machine-made or hand-made, that transforms ordinary materials into something extraordinary.” That sounds nice; however, I would like to add that if technology continues to overpower creatives by disseminating the designers’ work without any legal recourse, together we are witnessing in real life, how, what could have been a lasting marriage ends tragically. 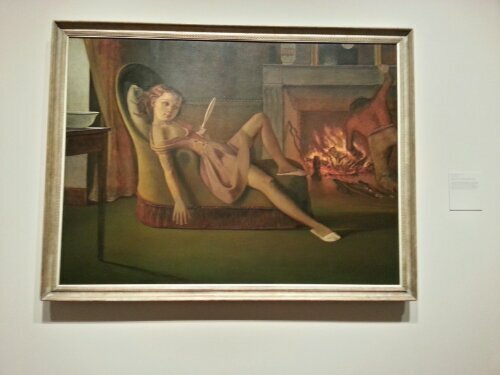 Lascivious but also ensconced in ennui, the darlings of Balthus’ paintings suggest adolescence as a time of volatile leisure.